One of Elvis' off-ice passions is the martial arts. 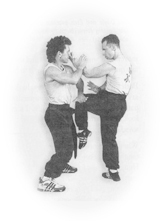 He earned a Black Belt in karate at the age of 16 and has been studying Hung Gar, a style of Kung Fu, under his sifu and buddy, Glen Doyle, since 1989. Elvis incorporated the circular motions of Hung Gar into his skating. In 1995, the two teamed up at the 1995 Wushu Championships in Baltimore, Maryland. Visit Glen Doyle's Official Site. One of Elvis' heroes is Bruce Lee, and Lee's book, Tao of Jeet Kune Do became Elvis' "bible". His brilliant 1993-1994 long program to Dragon: The Bruce Lee Story, was a tribute to Lee, and garnered him his first Canadian title, first World title and first Olympic Silver Medal.